Night March has always been countered: Karen, Seismitoad-EX, sometimes both… Zebstrika from Lost Thunder comes complete with an amazingly powerful Ability that not only draws you cards to extend your turn, but discards your hand, giving you another way to get Night March Pokemon into the discard pile. 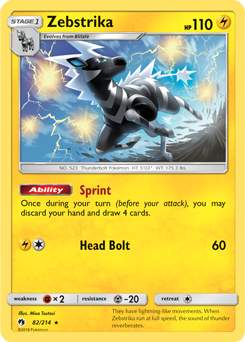 Zebstrika from BREAKpoint is also the perfect counter to the perceived counters of Night March itself, making it an amazing addition to the deck. There’s even more: you don’t have to play Pokemon-EX/GX like Shaymin-EX and Tapu Lele-GX anymore, as Zebstrika can do all the heavy lifting from the Bench without giving up two Prizes. The biggest draw to Zebstrika is that it is simply an amazing counter to Karen. It provides you a brilliant way to discard Night March Pokemon after your first few initial turns of Battle Compressor and Ultra Ball discards. Zebstrika fits into the deck quite well. It removes a bit of your early game pop since you won’t be playing Shaymin-EX and you’ll have to cut some of the Item-based draw like Trainers' Mail to fit it, but the addition is worth it. Your late game becomes much more balanced, executing your strategy every time with ease. Once you get multiple Zebstrika out, you can see upwards of twelve new cards per turn from Sprint alone which is honestly ludicrous. 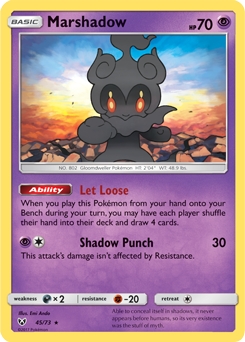 Night March has always been an objectively strong deck, pushing out large numbers and utilizing non-EX/GX Pokemon, but this turn reinvention breaks the deck. Karen, a counter designed with Night March in mind, is now just a slight annoyance that you can eventually turn against your opponent when they waste their turn using it. This was one of the first concepts in Expanded that I wanted to try out with this new set, and after testing it I can say that it is all it’s cracked up to be. Let’s get it! When I was initially playing four Blitzle I never found the need for that many. You usually just go for two Zebstrika, but three is a welcome bonus if you can get it. An extra copy of Blitzle in any count is desired mainly because of the BREAKpoint Zebstrika. Zap Zone breaks the Abilities of nuisances like Aegislash-EX, Shuckle-GX, Xurkitree-GX, and more when you attack with Joltik. The attack, Crashing Bolt, is even great against Trevenant, doing 110 to a Pokemon with Fighting Resistance. If your opponent puts down a Trevenant BREAK then they’ll be punished by Giratina, and if they don’t then Zebstrika can just roll tide. The problem against Trevenant BREAK decks is moreso keeping your Energy in play, but this is still a great attacking option nonetheless with larger HP than Night March Pokemon. I see Zebstrika like an improved Zoroark-GX in Night March: it draws you more cards per turn, thins your deck, and defends you better against Karen. The risk of playing Pokemon-EX/GX in Night March was always suspect, so now without them you’ll be much safer and well-equipped to beat any deck not having to worry about two-Prize Pokemon being sniped off your Bench. Zebstrika fills in for the likes of Shaymin-EX well enough, but Marshadow completes the deal and then some. Let Loose can win you games immediately if your opponent draws a bad hand, and when you have Sprint as an Ability afterwards you can Let Loose into Sprint and not be punished by drawing a bad hand of your own. It gives you a nice disruptive touch and extra reach to keep digging for cards or getting Night March Pokemon in your discard pile. It’s a great inclusion with even a single copy, but quite frankly I’m trying to fit in as many as possible and two is where that number stands right now. Devour Light gives you favorable matchups against Greninja BREAK and Trevenant BREAK, or at the very least makes them winnable. I especially like it against Trevenant BREAK which has gotten a major buff from the release of Morty, disrupting opponents like never before. While Giratina is a bad Bench sitter in other matchups, it’s just a Battle Compressor or Sprint away from being thinned out of your deck and out of your mind. I like covering all my bases and Pokémon Ranger does that here. Seismitoad-EX can shut this deck down fast so having a way to still play Items is amazing, and with the Expanded format being as wide open as it is with many different ways to disrupt an opponent, like with Chaos Wheel, Pokemon Ranger is super nice to have as a way to surprise an opponent and sneak out wins you otherwise wouldn’t have earned.